And when the crowds heard this, they were astonished at his teaching. These are reflections and notes on chapter nine of Harrell Horne's book, Teaching Techniques of Jesus: chapter 9, His Answers. Jesus not only asked questions as a way of teaching, but he answered the questions that were constantly peppered at him. Silence was the answer sometimes and there were only two questioners that he refused to answer. Do you know who they were? The big idea is that Jesus answered his questioners as well as their questions. For Jesus, behind every question is a person. This is the humaneness of taking the time, valuing the individuals, and seeing them as persons to be redeemed. 1. "You are mistaken, because you don’t know the Scriptures or the power of God." Jesus answered their argument that ridiculed the OT law, to say there can't be a resurrection, by telling them that they have no idea, no clue; they don't get it. Why? and What? He teaches that we must both know the scriptures and the power of God. And they do not, he says. 2. "For in the resurrection they neither marry nor are given in marriage but are like angels in heaven." Jesus proves to them that there is a resurrection, but that Moses' marriage laws only apply to our lives now and not then. He enlightens them that they have conflated two separate issues, to disparage the resurrection. 3. "Now concerning the resurrection of the dead, haven’t you read what was spoken to you by God: I am the God of Abraham and the God of Isaac and the God of Jacob?" Jesus references Bible material that Sadducees hold to be true, to teach that the resurrection is true. 4. "He is not the God of the dead, but of the living." 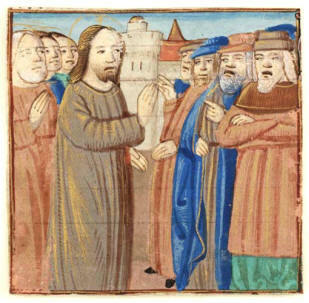 He shows them that Moses was shown that those who were alive and died are living and not dead. Jesus had to define the questioners who asked a disingenuous question. They came to Jesus, not to be taught, but to prove that they were right and he was wrong, through a question designed to illustrate the absurdity of Jesus' position, as they understood it. This is an example of people asking questions, who oppose you. They are not there to learn, but to cause trouble by making you look bad. You don't want to not take them seriously and say, "get out of here!" But you must first say something that expresses the idea that they completely misunderstand the topic or are mixing everything up. This is not character assassination but dealing with the premise of the question. Horne says that Jesus' answers, throughout the gospels, had a wide variety. Informational, i. e., his answer gave information. Profound (for a series of profound answers, see John 6). An answer in the form of a question. An answer in the form of a dilemma. An answer to the questioner as well as the question. An answer different from the one wanted. An answer in the form of a story. An indirect answer (see Matt. 18: 1-6). A practical answer to an academic question (Luke 13:3, 24). Artist credit, unknown, found here.